Simple, delegable, profitable – comprehensive skin cancer screening with FotoFinder! Many melanomas develop on healthy skin and not from a pre-existing nevus. 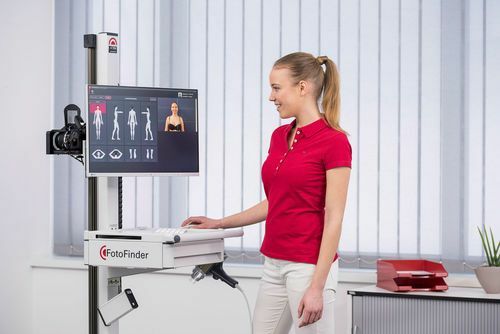 For this reason, full body skin cancer screening with FotoFinder bodystudio not only examines the individual nevi, but the entire surface of the skin. In combination with digital dermoscopy and total body photography, you can offer a screening package reaching far beyond video documentation and make not only high-risk patients but all patients loyal to your practice! In addition to the components for epiluminescence microscopy, all bodystudio systems also include a high-resolution digital camera system for brilliant full body photos. With the new turn-key automatic ATBM® procedure, documenting the entire surface of the skin takes just a minimum of time! The software shows step by step how the patient is photographed from head to toe and visualizes changes at a glance.